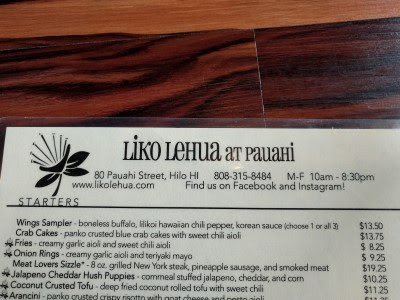 Our last night in Hilo we decided to try Liko Lehua for dinner. They take reservations, so we made a reservation. We were seated at a booth which surprised me because usually since I am in a wheelchair, we are seated at tables instead of booths. I didn't want to sit on the end of the booth, sticking out, so we scooted me into the booth. The seat was uncomfortable for me and I felt like the table was way too high/I was seated way too low, so we had to scoot me back out and I sat on the end. I felt like I was sticking out into everything, but it was much more comfortable for me. 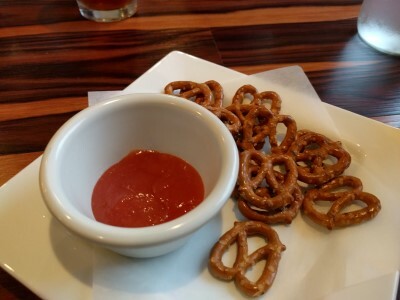 There was a snack of pretzels with a guava butter dipping sauce. 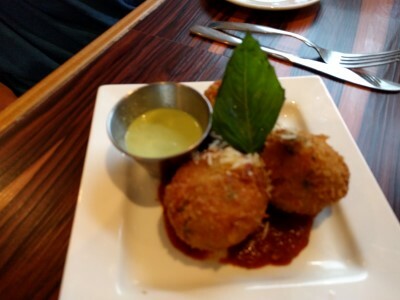 We shared an appetizer of Arancini (panko crusted crispy risotto with goat cheese and pesto aioli). Apologies for the blurry photo. I only took one photo and this is it. These were yummy. Crispy exterior. Cheesy interior. 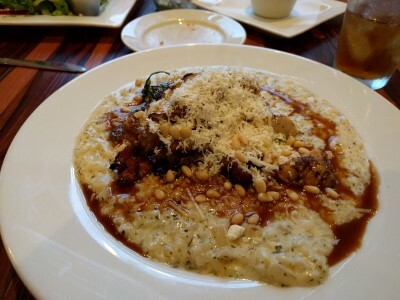 Chicken Risotto (herb roasted chicken, creamy risotto, feta, balsamic drizzle). This was really tasty. Herby chicken, creamy risotto, salty feta, the sweet balsamic tang. So good. 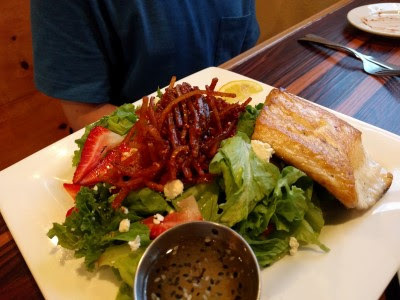 It also was a large portion for me. Even with SP's help, I couldn't finish it. I took the leftovers back to the hotel since we had a microwave. I think we ate it cold the next morning. We were too full for dessert even though a couple of options were appealing (apple crisp, s'more, bread pudding). We both enjoyed our food. Our server was terrific and made sure there wasn't any garlic in my meal. 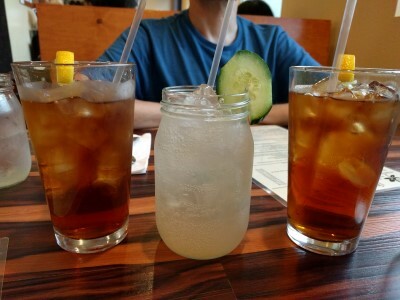 It was relaxing and casual, a nice way to unwind after a busy day of driving around seeing the sights. There was a wait when we left so I'd suggest making a reservation. If we're ever again in Hilo, we'd dine here.